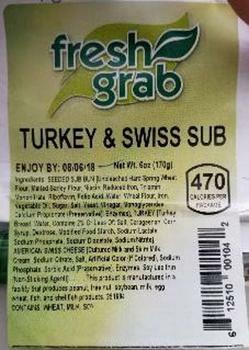 Lipari Foods is recalling Premo brand and Fresh Grab turkey and Swiss submarine sandwiches produced and packaged by JLM. The recalled products were distributed starting July 19, 2018, to food service and retail stores throughout Florida, Illinois, Indiana, Kentucky, Michigan, Minnesota, Ohio, Pennsylvania, Tennessee, Wisconsin and West Virginia. Customers who purchased the recalled products should not consume them, but discard them or return them to the place of purchase. Consumers with questions may call (800) 729- 3354, 8:15 am – 4:30 pm (EST) Monday through Friday.